A basic version of BVITS Ideas Generator is written in Axon Idea Processor. Axon Idea Processor Axon2007 Lite (Free-ware) can be downloaded and use with the Axon BVITS Idea Generator to give you innovative ideas. 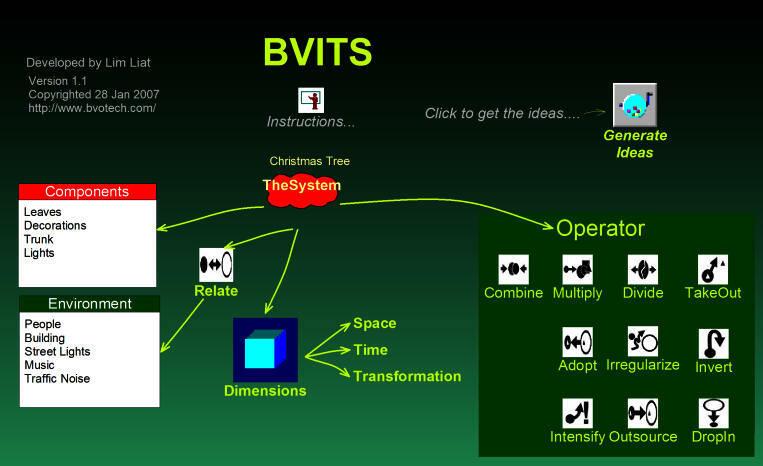 Two examples of BVITS Ideas Generator are made available for your use. An iconic Christmas Tree example. click on Components to enter the components in your system. click on the Environment to enter the objects in your system environment. click on Generate Icon to get the list of of innovative ideas.